Supplied to Robert Ferguson, M.P. (d. 1840) for Raith House, Kirkcaldy, Fife. 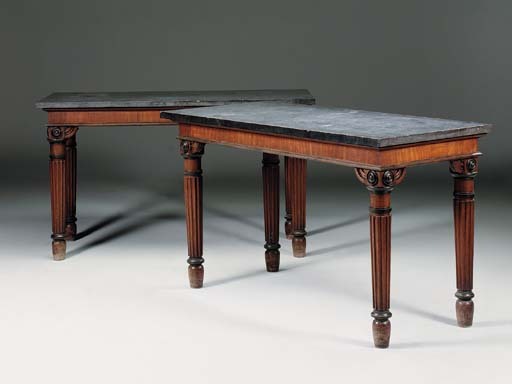 The pair of sideboard-tables designed by George Bullock for Robert Ferguson's Dining-Room at Raith, display 'Grecian' black tops of Bullock's Welsh 'marble' (slate). Their columnar legs, which are wrapped by Egyptian-reeded bands, display Grecian-black libation-patterae recalling Ceres as harvest deity and popularised by Thomas Hope in his Household Furniture and Interior Decoration, London, 1807 (pl. XVIII, no. 5 and pl. XIX, no. 2). The latter ornament also featured on a variety of furniture that Bullock sent to St. Helena, following his commission in 1815 to design furnishing for a residence for Emperor Napoleon (see M. Levy, 'Napoleon in Exile', Furniture History, 1998, pp. 1-210). ...Carved mahogany oblong table with black marble top'. A related brown oak serving-table, with patera-enriched frieze, was supplied by George Bullock to Matthew Robinson Boulton for Tew Park, Great Tew, Oxfordshire in 1818. It was sold by the Executors of the late Major Eustace Robb, Tew Park, Christie's house sale, 27-29 May 1987, lot 57.